When I first started photographing insects, I noticed — but didn’t really look at — lots of little “bees.” I noted their brown and yellow abdomens and quickly dismissed them as uninteresting. But once I actually photographed one of them and looked at it, I was enchanted by the pretty patterns I saw, and wanted to study them further. As an example, notice the intricate designs on the one in that first photo above. 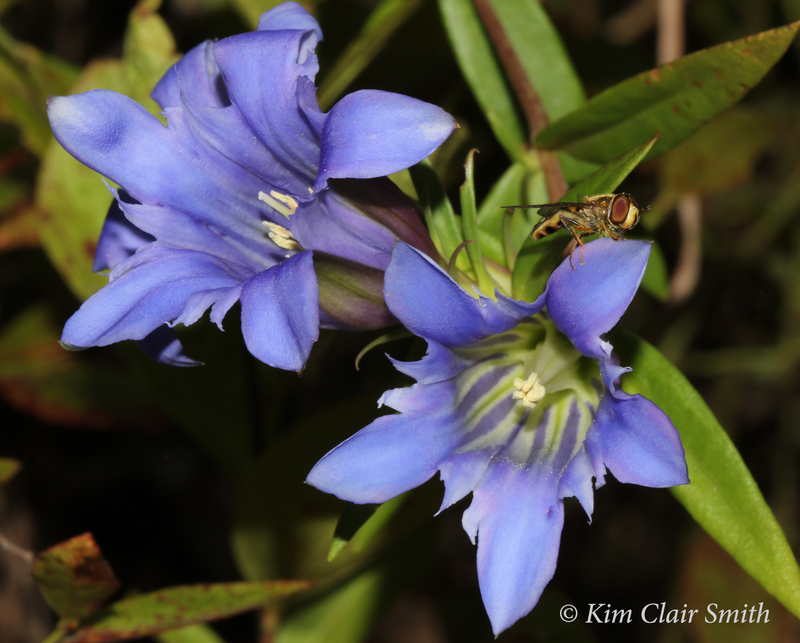 I learned that they aren’t bees at all; they’re a family of insects known as hover flies or flower flies. Many of them resemble not only bees, but wasps as well. It’s believed that this mimicry aids their survival by making potential predators think twice before attacking them. A simple way to distinguish flies from bees or wasps is the number of wings; flies only have two wings, whereas bees and wasps have four. My familiarity with taxonomic structures is mostly limited to my high school memories of reciting “Kingdom, phylum, class, order, family, genus, species.” I’m doing the best I can to make sure I give accurate information about scientific classifications here, but keep in mind that I’m a real amateur in insect identification. I write these articles to educate myself as much as to entertain and educate my readers. 🙂 And, if you read something here that’s wrong, I’d really appreciate hearing from you so I can correct it. So, within the Insecta class, there are further subdivisions called orders. For example, the order Odonata contains my beloved dragonflies and damselflies. The order Hymenoptera contains bees, ants, and wasps. These hover flies are in the order Diptera. And within that order, they’re in the family Syrphidae (and are thus also known as syrphid flies). 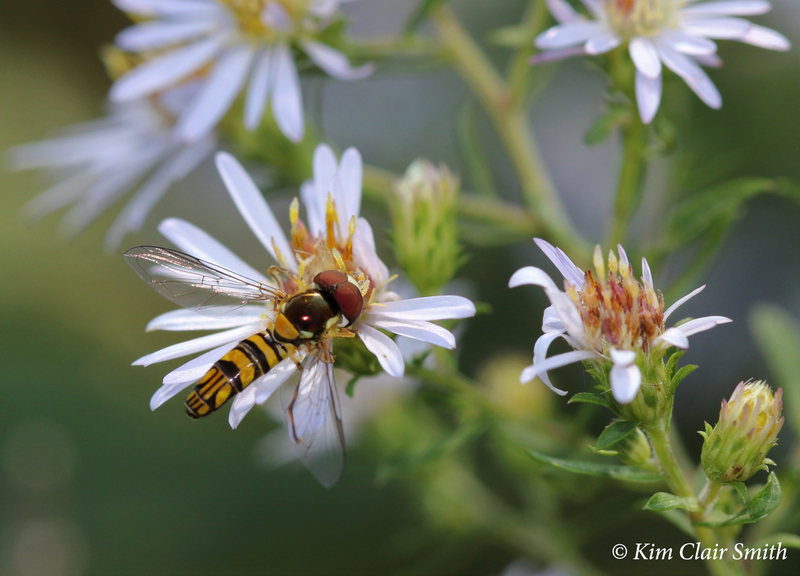 So whether you call them hover flies, flower flies, or syrphid flies, you should know that they are valuable pollinators in the garden. And if you have aphid problems, you’ll be happy to find out that the larvae of syrphid flies are little wormlike creatures that are ravenous consumers of aphids. If you see these lovely little flies in your yard, keep your fingers crossed that they like it enough to stick around and lay their eggs there. You can make it easier for them by not removing leaves from your garden in the fall because that’s where they spend the winter. Interestingly, hover flies share some extraordinary capabilities with dragonflies: they can hover, and fly forward, backward, sideways, up, and down. 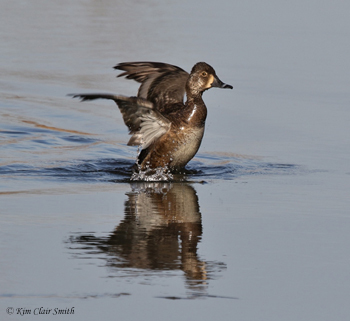 Their flight abilities make them fascinating to watch; I can easily lose track of time when I’m focused on watching them zipping around a patch of flowers, feeding on the nutritious nectar and pollen. 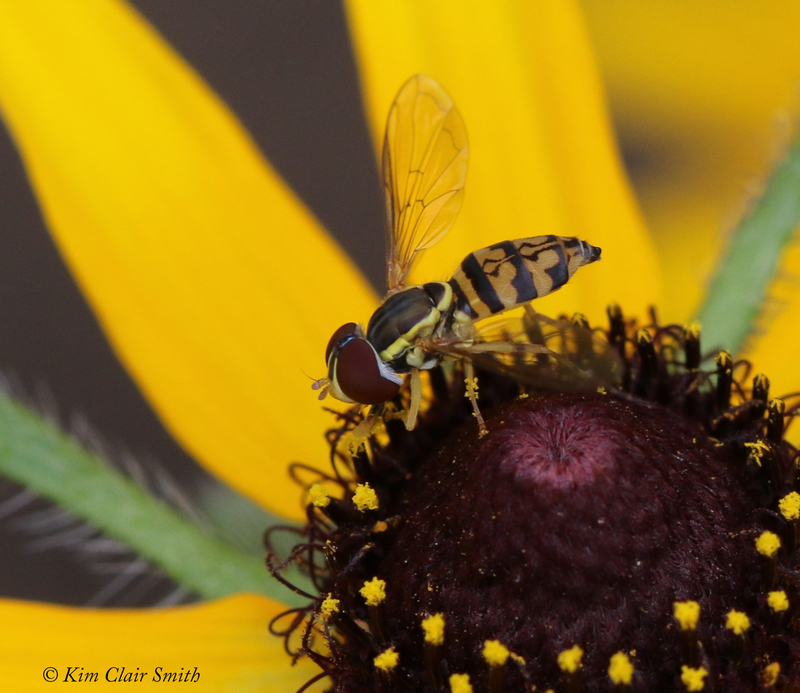 I plan to continue my study of these syrphid flies, and will hope to be able to write more about them in a future post. If you get a chance, pull up a chair beside a group of asters or goldenrod soon and see if you can catch a glimpse of any of these charming flower visitors. There’s a little bonus for you below, but I just want to share one more photo. 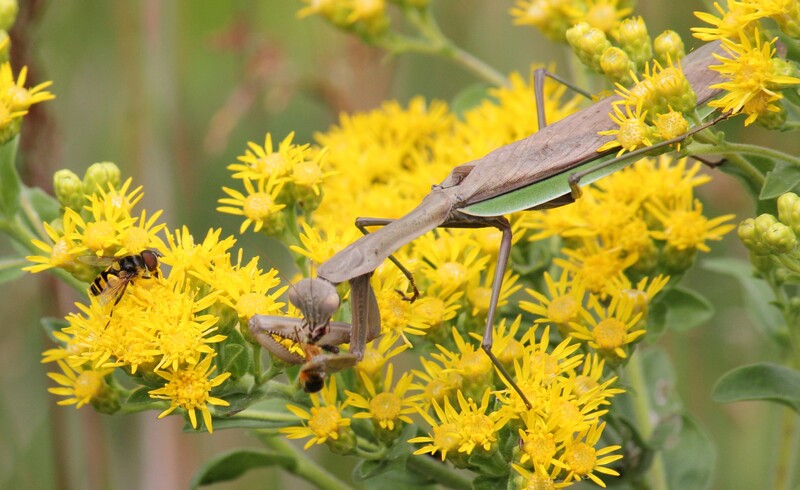 One day I was watching this Chinese mantis as it preyed upon bees from its perch on top of a cushion of goldenrod. In this photo, the mantis is eating a honeybee while a syrphid fly feeds only a couple inches from its head, seemingly unconcerned about the monster lurking beside him. Perhaps he realized the mantis was occupied and was no immediate danger to him. Bonus Deep Dive Content: Okay, if you’re interested in watching a syrphid fly larva eat an aphid, you can spend 25 minutes watching this amazing video I found on YouTube by someone called “Insect Man.” I confess I fast-forwarded through some of it, but it’s way cool. 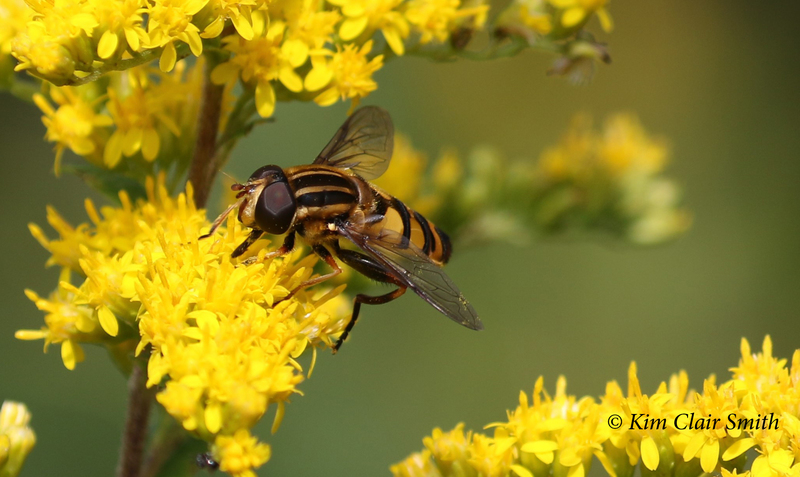 This entry was posted in Insects and tagged flower fly, hover fly, mimicry, Ohio, pollinator, syrphidae. Bookmark the permalink. Marian, I laughed out loud when I read your comment! I’m so glad I keep surprising you. Thanks for your support. Lots of valuable and interesting information here, but it’s overwhelming, isn’t it? I’m glad you don’t have pop quizzes after reading a post! I’d flunk for sure! But WOW!!! What a great world it is out there!